The race for third and fourth is going to be fascinating. I would not like to call who will miss out. You? Join us on Tuesday night for two more Premier League games. Until then, check out the match report here. Arsenal manager Unai Emery speaking to BBC's Match of the Day: "We played very consistent over 90 minutes. We didn't concede any chances. We created and dominated the match. We are happy. "Each match is very difficult - we got three points and did it our way. "It's a nice challenge to win consecutive matches. It's a new history. We are creating our own way. We have created a big atmosphere here. "We are in a good moment but each match is a new test. I hope Aaron Ramsey's injury is not serious. The doctor is thinking it's a small injury. "We are improving. Today we can finish third, but the next match against Everton is difficult. Our rivals are going to win a lot of matches." More from Newcastle manager Rafa Benitez: "We played against a good team and were fine for a while in the first half. We could avoid their goal, it was a little bit lucky. "We had situations on the counter attack where we could be more dangerous but we didn't do it. The last 10 minutes they had chances to score but until the second goal we were pushing. It is a shame because you could feel the atmosphere was getting nervous. "When you play top sides away it can be a mistake which makes the difference. In the end it was a mistake and we must learn from this and be ready for the next one. "I think 38 points is enough, 40 just in case. Hopefully it will be less." Newcastle manager Rafael Benitez speaking to Sky Sports: "I think this kind of game is very similar. We were close, but it was about chances in the final third. "After you have to defend against a team with pace and quality. You have to do things right in defence. After we conceded the second goal it became even more difficult for us. "We tried to attack but they are good team at home - they play and pressed. "We were pushing at 1-0. They need to score the second goal. Both of their goals were scrappy goals. "The final third we have been speaking all season, the final third you have to spend £40m £50m, £75m. "We have to try to get three points against Palace. The next match is the most important. "Obviously last week the teams at the bottom, except for Cardiff were winning." Arsenal manager Unai Emery on Sky Sports: "We were good individually, our players gave us quality and they worked for the team. Our supporters at home are very important and we can be stronger together. "We were improving little by little and our first goal helped us a lot. Mesut Ozil has quality, when he can find the best performance for the team, he is playing like we want with the system and how tactically we want. He is giving us his quality. "I think Aaron Ramsey is happy, he is helping us and is playing with a very good performance and scoring. Each energy from the players is very important for us and he is doing that. We are at the most important moment of the season. "We are making progess in the table but we know it is difficult, Tottenham, Chelsea and Manchester United are going to win a lot of games." 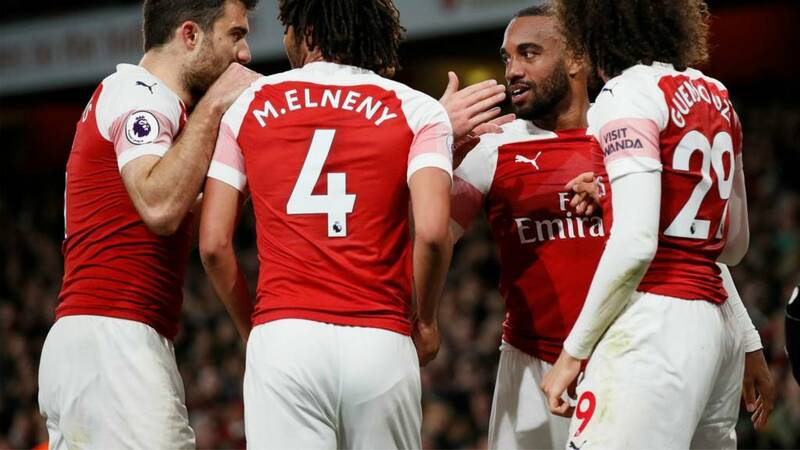 Arsenal are finishing a Premier League matchday ahead of Tottenham in the table for the first time since December 2, after they beat their north London rivals 4-2. There were just 10 shots in this match, the fewest in a Premier League game since Bournemouth vs Leicester in August 2015 (9). Newcastle defender Paul Dummett on Sky Sports: "That was really tough. They punished us when we made mistakes. Mistakes were made at the back, me included. "At 1-0 you always have a chance. The longer the game goes on the more pressure there is on them. "They killed the game when they got the second. "Arsenal a a good team and they stopped us from [attacking]. We're still in a good position and there's six games to go - winnable games. "I think one more win does it. We have to keep on going and take each game as it comes." Arsenal goalscorer Alexandre Lacazette on Sky Sports: "It was a big game tonight, a tough game. The coach said we had to be patient and efficient in the box and we did that. "It's always like this against Newcastle. We are happy. "I can feel the difference in the atmosphere from last season, now we can maybe go to the Champions League. The fans helped us to get third place. We work every day to be in third place, now we must stay in this position. "I would like to score away from home too but if we win that's all that is important. We are more confident, everybody knows what we have to do." Aaron Ramsey was sensational in the first half. I think what he's saying to Arsenal fans this season - he is showing them what they will miss. He was sublime tonight. He is playing with such a clear mind. Gareth Murray: Arsenal have had to work very hard for this win, not due to any Newcastle resistance, more for the poor refereeing from Taylor. Arsenal were really, really impressive. They have been flying at the Emirates all season. When you think about it, the top four looked too far away at the start of the season but it's in their hands now. Five out of the last seven are away now for them. They limited Newcastle to very few chances. You feel Arsenal fans are right behind Emery. In some ways they are overachieving this season. Who is missing out in the top four then? 10 home league wins in a row for Arsenal. Moving on up. Eddie: 2 good Arsenal goals disallowed by Anthony Taylor now. Newcastle are too good to go down. They're a well-organised outfit, a structure about them, they have a way of playing now. The gap is too big between them and Cardiff. It is illegal to trade in Premier League goalkeepers, I can confirm as much. Soft is how I would describe that decision. A comfortable enough win for the Gunners in the end, albeit it without much gloss applied.